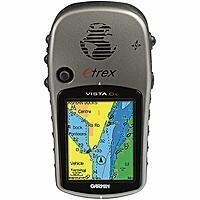 The eTrex Vista Cx is a versatile, pocket-sized handheld mapping product ideal for both marine and outdoor use. It provides a bright, sunlight-readable color TFT display and includes a 32MB microSD card for storage of optional map detail. Garmin preprogrammed microSD cards can be purchased, providing detail for Topo, BlueChart, Fishing Hot Spots, Minnesota LakeMaster Promaps and European streets. The 32MB microSD card can also be loaded with data from MapSource products like BlueChart, U.S. Topo 24K, Minnesota LakeMaster Promaps and City Navigator. Fast USB connectivity makes loading charts and maps quick and easy, while navigation instructions can be shared with repeaters, plotters, and autopilots using NMEA protocols through the dedicated serial port. The Vista Cx incorporates a barometric altimeter for extremely accurate elevation and vertical profile data. An electronic compass displays accurate heading while standing still.